The number of troops deploying to the southern border has now increased to 5,000, a huge increase from the initial 800. President Trump on Monday told the Caravan that the US military will be waiting for them. “Many Gang Members and some very bad people are mixed into the Caravan heading to our Southern Border. Please go back, you will not be admitted into the United States unless you go through the legal process. 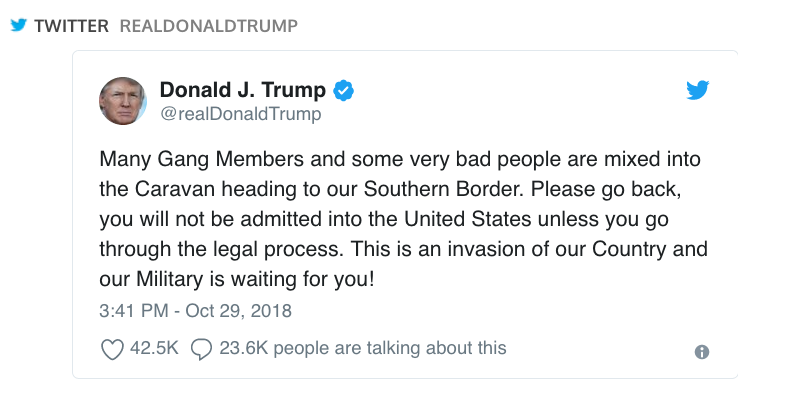 This is an invasion of our Country and our Military is waiting for you!” Trump tweeted. The Homeland Security official also said the president is expected to deliver a speech on Tuesday to outline further actions to halt the migrant caravan, which could include limiting, or halting, the ability of migrants to request asylum. That move would be predicated on national security arguments similar to those used to enact Trump’s travel ban last year, and would definitely meet the same legal challenges by immigration advocacy and civil rights organizations. Yesterday, General Mattis confirmed the delivery of military equipment to the southern border.